Meet with Superintendent to see if the Salad Days model is still viable and the partnership should continue by the fall of 2018. Done! - the Superintendent arranged a meeting with remaining principals to measure interest. Meet with Principals at remaining schools to recruit 2 additional schools to expand to by fall of 2018. Done! - successfully recruited remaining 9 schools. Have The Food Project (TFP) Dirt Crew build raised beds in the late fall or early spring at local elementary schools to be finished by the spring of 2019. Have FoodCorps and UMass Extension partner and incorporate two new schools in the current systems for Salad Days by the spring of 2019.. Develop sustainable model of staffing and resources that can support the Salad Days model in the School District by the spring of 2019. Research other potential staffing possibilities to support Salad Days to more schools by the fall of 2018. Fold in additional staff support by the spring of 2019. Survey landscape of current food education pieces happening in Lynn by the fall of 2018. Identify what topics should be covered as part of ‘food education’ by the fall of 2018. Compile running list of all groups and individuals who are doing food education trainings/workshops in the city and share with others by the fall of 2018. Done! - the subcommittee has put together an initial list that will be ongoing and will share on website. Pilot an experiential food education program for Lynn residents that compliments and leverages existing food education resources by the winter of 2018. 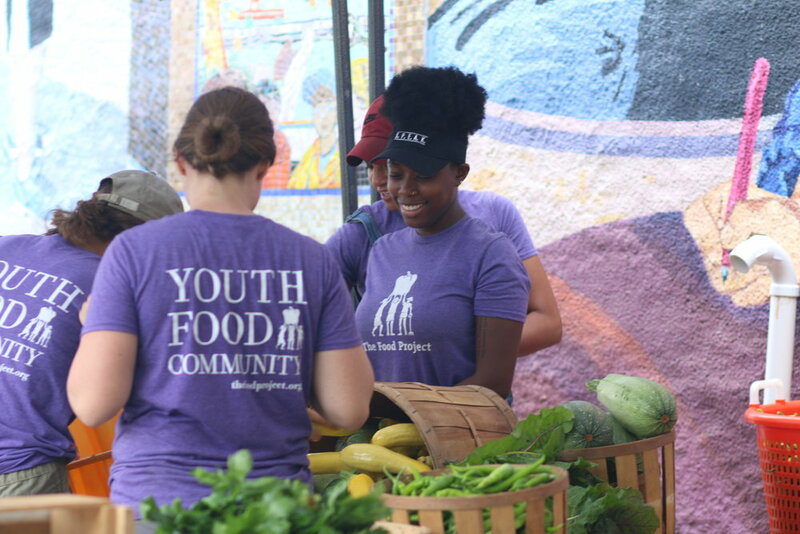 Work with TFP Root Crew to create a public workshop series that engages with community members around the cooking and eating of food by the winter of 2018. Work with TFP Root Crew to create a public workshop series that engages with community members around the general knowledge and awareness about the food system by the winter of 2018. Our goal is to expand existing food access points for low-income residents in Lynn. Identify two mobile market sites in the city to provide access to fresh, healthy and local food by the summer of 2019. Create categories to identify market sites (population density, access to public transport, demographics) by the winter 2018. Identify two new market sites to implement Mobile Markets in the summer by the spring 2019. Work with TFP Root Crew to create marketing plan for new Mobile Markets sites by the spring of 2019. Explore possibility of centralized food distribution system by the winter of 2018. Work in partnership with the Food Business priority Subcommittee to identify mid-size level grocer that would be interested in working on a smaller alternative food distribution system by the winter of 2018. Streamline mobile market process to reach more residents and sites by the winter of 2018. Secure funding for the development of a mobile market trailer that will streamline setup and transportation of produce by the fall of 2018. Done! - secured MDAR (Mass Department of Agricultural Resources) funding and will work with local contractor to build a trailer by this winter to launch for 2019. Our goal is to expand, develop and support a variety of funding streams for consumer incentives that focus on local purchasing of fruits and vegetables for low income residents in Lynn. Develop a network of local farmers and consumers that can advocate for the Healthy Incentives Program (HIP) at key moments throughout the year - ongoing. Work with TFP Root Crew youth to educate and organize community members to advocate for HIP funding by the spring of 2019. Develop strategy, tracking and communications process to mobilize network by the winter of 2018. Gather state data on HIP to share information with institutions and community members by the winter of 2018. Research, develop and pilot a new innovative model that addresses those that still experience food insecurity, but do not qualify for the Supplemental Nutrition Assistance Program (SNAP) by the summer of 2019. Research information about value card programs/ loyalty programs to see what has been implemented in the country by the winter of 2018. Gain access to Lynn Community Health Center’s survey data to help inform a new model for food insecure clients that do not qualify for SNAP by the winter of 2018. Develop and implement plan to recruit residents to enroll in SNAP and residents that do not qualify for SNAP by the winter of 2018. Develop and pilot new model for food insecure clients that do not qualify for SNAP by the summer of 2019. Identify funding streams to provide Incentives - ongoing. Have the TFP Organizational Research Fellow and Development team identify streams of funding for pool of money to pilot partnership which will be an ongoing process - ongoing. Our goal is to build upon existing partnership with the city around community garden management and build up the community garden network. Build 45 new community garden beds by the spring of 2019. Work with LFFA to identity new garden sites to build by the winter of 2018. Work with TFP Dirt Crew youth to build raised beds by the spring of 2019. Create more robust communications and engagement between gardens and gardeners in the city by the winter of 2018. Survey how to connect and communicate efficiently with all gardens and gardeners in the city (LFFA) by the winter of 2018. Implement new communications process with all the gardens and gardeners in the city (LFFA) by the winter of 2018. Work with TFP Dirt Crew to celebrate the gardens and gardeners in the city by the winter of 2018. Explore what it would take to transition Garden Coordinator position to the City by the spring of 2019. Have conversations with the city about the possibility and what it would take to make this happen by the winter of 2019. Our goal is to build a win-win local and healthy food system that encourages small business development, economic growth and affordable local food/ healthy options for Lynn residents. Have at least 3 businesses/vendors committed to offering produce (local and non-local) in spaces where normally not available by the summer of 2019. Work with committee members to identify 3 businesses/vendors that offer food that is culturally relevant who are interested in getting more produce in their space by the fall of 2018. Conduct meetings with 3 businesses/vendors on how they are willing to partner by the winter of 2018. Partner with one business/vendor to measure metrics around impact, conducting pre and post surveys by the winter of 2018. Work with the Local Enterprise Assistance Fund (LEAF) to apply for Technical Assistance Funding to implement pilot distribution and business model with metrics and measurements by the summer of 2019. Create positive marketing campaign for partnering business/vendors by the fall of 2018. Work with TFP Root Crew youth to develop and implement marketing plan with involved businesses/vendors by the spring of 2019.